I Just Purchased a Manual Typewriter! Someone posted a question on FPN about manual typewriters and whether anyone owned one. This immediately peaked my interest. I love all things old and writing related, so why not? It’s a writing instrument right? 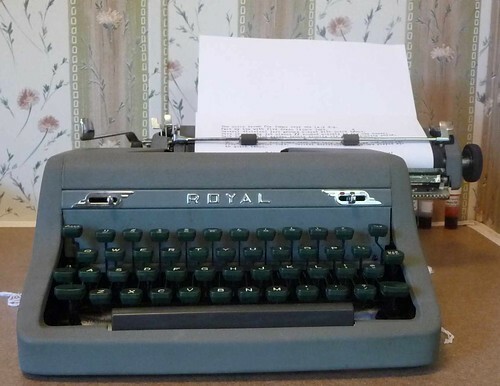 This is a 1950 Royal Quiet De Luxe manual typewriter! It was in exceptional condition, and it is in perfect working order. I’ve already been typing away on it. Anyway, this is just a sneak peak. There will be a typecast review of it in a few weeks! How fun! I love the look of typewritten documents these days (awesome font is why). Congrats on your new addition! Ah this is somewhat scary. I believe I used a typewriter just like this in high school. Nice find. I like to cruise garage sales and I see typewriters here and there. I probably would go for something older or newer. I remember the IBM Selectric typewriters. Great touch on the keyboards. Somewhere there is an article on interfacing any typewriter to a computer. It was pretty clever. My grandfather was a typewriter repairman so I grew up with them in my life. I wish I kept one! Enjoy yours. Wow, I totally want one of those. Nice buy! So somewhere out there are typewriter collectors. (-: We should go find some of them. I can see where displaying your collection and selling at a show could be a lot of effort. I remember in Alameda, Ca there is an old office equipment repair shop that had an extensive collection of old typewriters on a shelf surrounding the store. 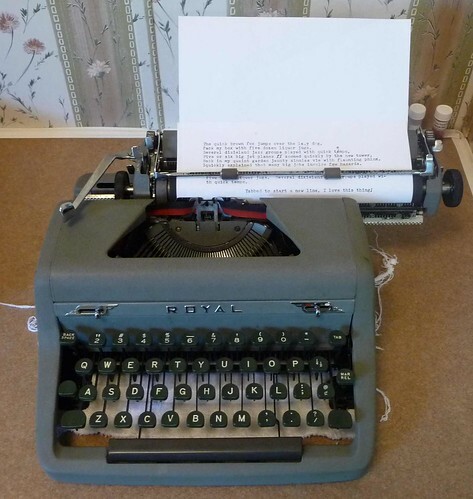 I recently bought a typewriter at a garage sale and after being inspired by Strikethru’s blog, I have begun to use it and I joined TYPEWRITERS group on yahoo. Plus, I recently got the cutest tpewritten thank you note and I blogged about it on 7/27 at http://www.lettersandjournals.blogspot.com. Looking forward to some fun on this.